It was not long ago that we discussed both Android tablets and the Pixel C, where we explored the shifts in hardware and software that the big-screen Android devices have been going through in accordance to the tablet market as a whole. But many might be quick to remember another point we had raised: the fact that Android is not chained to Android OEM devices, and that the Surface in particular could run Android as well. Because of this, Microsoft inadvertently built the best Android tablet hardware, in part because there is no such thing as “Android-only Hardware”. Android-x86 and Remix are bringing the Android experience to all sorts of computers, including full tower-desktops, laptops, ultrabooks, and of course, hybrid tablets. This last point is the most interesting one, I think, because of the hardware involved. If we look at tablet hybrids, they typically pack substantially more RAM than Android tablets do, and some flavors come with very-powerful x86 processors. I personally own a Surface Pro 3 with an i7 processor and 8GB of RAM, which is more than enough for a semi-desktop experience on-the-go and the things I bought this for (work and school). But when I boot into Android, the device feels even more versatile. I’ve seen discussions on technology forums raising the question, “why would you want Android on your Surface?”. I am obviously biased given I write for this site, but it’s no secret that Microsoft has offered a sub-par tablet experience as well. Windows RT was an abomination, Windows 8 was also a forced implementation, and Windows 10’s tablet mode is not optimal either. Metro apps do make in-app-navigation much better than simply trying to use desktop apps with one’s index finger, but I do believe that Android on tablets, with all its faults, is still better for media consumption than Windows’s tablet mode. Metro apps even out the field, but plenty of them still suffer from poor UI allocation in my opinion. That’s where Android-x86 and Remix come in. With these kinds of OS alternatives for traditional computers, and by extension, hybrid tablets, I can turn my Surface – a device I bought strictly for work and college – into an Android tablet that I can use for media consumption, and even to tinker with. Now, it is true that all of Android’s tablet UX downsides carry onto your hybrid device when booting Android-x86, but at the very least, you get (typically) better hardware and an extra two-in-one in your two-in-one. Android-x86 is sometimes not very compliant with PC hardware though, and I know XDA Editor Mathew didn’t have the best experience on his bleeding-edge gaming machine. But Remix is aiming to fix these experience disparities by merging the best of the Android ecosystem on tablets with the best of desktop functionality, while also making good use of the hardware. 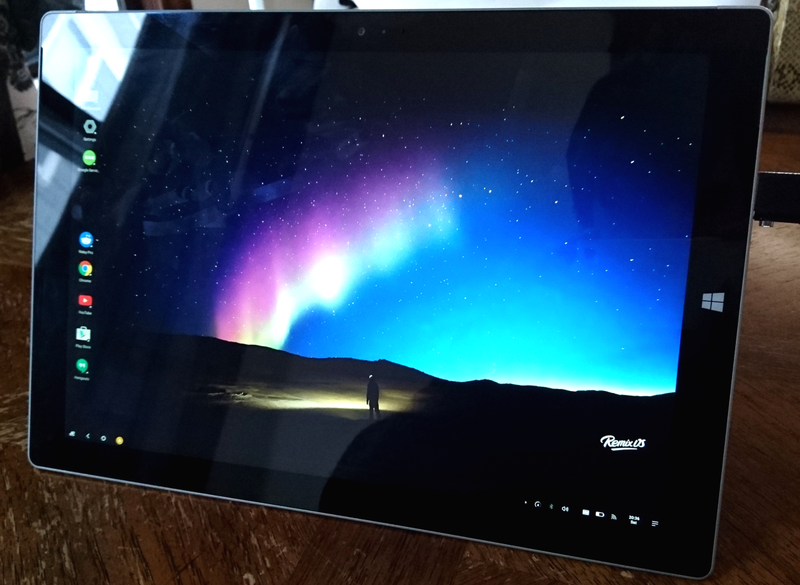 Remix OS on my Surface Pro 3 really did surprise me. Running the Alpha build has gave me a good taste of what to expect in the future and the upcoming March release. As of now, though, I am very satisfied with what I got out of Android on this hardware. Remix OS allows me to run apps as you would on an Android tablet, but also allows for a no-nonsense multi-window experience that is both clever and familiar. Watching a youtube video while scrolling through reddit on Remix feels incredibly natural, and because you can have both landscape and portrait floating apps with free-positioning or splitscreen, it won’t take you long to find your ideal setup. Running off USB 3.0, not SSD. Another feat of Remix OS is that, barring alpha-build bugs, the experience is phenomenally smooth, especially in terms of performance. Now you might point out that this could simply be due to overkill hardware, but it must be stated anyway — Remix OS on my Surface runs beautifully smooth, with Material animations never skipping a beat, and little to no loading time on my favorite apps. Chrome on the Surface Pro 3 was particularly smooth, the smoothest I’ve ever seen Chrome on Android, and I think this might have to do with the hardware architecture in place as I noted with the ZenFone 2. Benchmarks are outrageously high and games work as they should… and this is running off a USB 3.0 stick. The March release will allow for easy installation on an SSD partition. Note that you can find guides to copy the OS onto a partition to make it work this way already, but Jide will offer an easier solution, and also expand the OS to 32-bit systems. The experience is far from perfect (especially with accessory compatibility/full hardware support), but Android-x86 and Jide have now partnered and we can only assume this will accelerate the refinement of both options. Overall, though, Android’s openness ultimately means you can enjoy the OS on more than just whatever comes with it pre-installed, and we are seeing that with projects like Remix OS, Phoenix OS and the monumental Android-x86 that makes the former possible. I hope that Google has taken notes on what these projects and companies, and others like Andromium, have been doing. This kind of innovation brings Android computing to new dimensions of productivity, but also to a much wider-range of devices. Hopefully the lessons that we gather from them will be implemented in Android N and the successor of the Pixel C. Until then, current Pixel C owners should really look forward to a possible Remix OS port — now that would be a good combo.